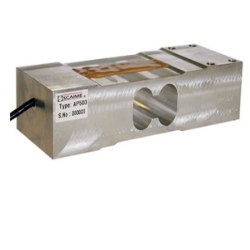 Scaime AP features Low Profile, high capacity single point load cell, designed for platforms of up to 28 inches x 28 inches (700 mm X 700 mm). Excellent off-center loading characteristics. Aluminum construction. Capacities of 75,100,150, 200, 300, 500, 635 kg. . 6 wire, shielded, jacketed cable, 10 feet long, standard. Similar to Tedea 1250 but height is quite a bit lower. Scaime is the only manufacturer; world wide, who manufacturers instruments under surveillance of the provincial (state equivalent) weights and measures jurisdiction. Monthly evaluation of in process manufacture is performed. Non-conformance means drastic penalties such as shut down of the line until corrective measures are implemented. SCAIME is ISO 9002 certified. As you're looking for a Scaime load cell distributor, keep in mind that we often ship these replacement load cells out within one business day. The wiring that is shown on the AP series spec sheet online is +Exc Brown, -Exc Green, +Sig Yellow, -Sig White, +Sen Gray, -Sen Pink.